I am blessed to be married to a woman who loves Jesus deeply; who desires to grow in her faith and walk obediently to the Lord; who desires God’s best for her husband, kids, and friends; and who works endlessly to take care of her family and home. I was blessed to see her work in the kitchen for two long days to prepare a wonderful spread for our Thanksgiving guests. Everything was not only thoughtfully planned, but thoughtfully prepared. I lack nothing of value. Thank you, Lord. It’s football season and almost time for the State Fair of Texas, so these really hit the spot. Our dear friends, Ken and Lucy Nunn, from North Carolina blessed us with a treasure trove of goodies. 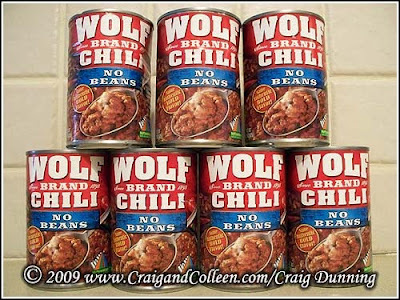 And among the goodies were several cans of Wolf Brand Chili, which are now being rationed. Ken likes a challenge, so he searched the Internet to find where he could get Wolf Brand. We never imagined Ken would go to the trouble of shipping WBC from San Antonio, Texas to North Carolina so he could bring it to us in Israel, or we would not have asked for that item. However, Ken and Lucy are like that: They really want to bless those they love. And in God’s mercy, we have been one of the targets of their love. Over the years they have brought a variety of things for us and others: clothes, candy corn, licorice, scented pencils, beef jerky, kids books, scholarships, baseball uniforms, baseball equipment, and chili are a partial list. And, all of it has been gathered, packed and carried with lots of love. Ken and Lucy, you are a treasure. We love you. By the way, the chili has been enjoyed in the form of chili cheeseburgers and chili dogs. Next up: Nachos with a perfect blend of cheese, chili and (recently acquired) jalapenos. Thanks for your part in the menu.